MUCC (ムック-Mukku) was formed in 1997. The band was named after a characters children's television show "Hirake!" The band also has the nickname "69" as their band. since the number six and nine can be pronounced "muku" The band originated in Ibaraki, Japan. 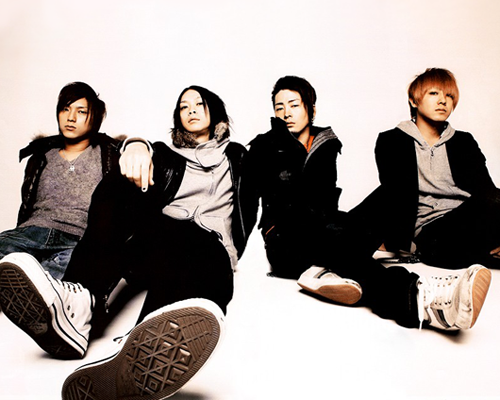 MUCC was formed by Miya, Tatsurou, Satochi, and Hiro. How ever in 1999, Hiro who is now currently in Alice Nine, left the band and was replaced by Miya's childhood friend Yukke. The band has been through both good and rough times. I remember reading an article where this band had beer bottles thrown at them because they were opening for a band. Most people would leave the stage but this band stood their ground and then the band they were supposibly opening for walked out on stage and stated that if they didn't give MUCC respect then they weren't going to perform. The first time I was introduced to this band was by coincidence. I was on youtube surfing for bands to listen to. I was till in high school and I came across this song. That song was "9月3日の刻印" or "Engraved on September 3rd" The song showed a young boy standing in the middle of the sidewalk as people passed him by then shifted to the band playing. My heart sank to my stomach. Granted this mostly talked about a boy, I still couldn't help but feel some connection to the song. The glum look of the bands' faces and Tatsurou's raspy voice that depicted the emotion of that song so perfectly brought me to tears. After that I began to listen to their music more and more. I have to say when I first heard of VIsual Kei, Harmonicas were far from my mind. I have to say that bands tend to go through stages to determine their place. Listening to MUCC's new album I noticed a dramatic change from their older days. I don't think it's a bad change, they pull it off quite nicely in my opinion but I was shocked to find the band using auto tune. Also the band seemed changed their beats a bit. While I'm use to the grunge, screaming, raspy voice of Tatsuro. I feel as if they evolved into the new age grunge scene. I'm not saying this is a bad idea but it will indeed test the loyalty of their fans. Over all the band is truly something amazing. They have earned my respect by continuing to do music even if non fans show up to a show just to chuck some beer bottles in dismay because they want the band off stage. What pleases me the most is that the band seems to be making music for themselves and not for anyone else. Bands like that, such as Dir En Grey or My Chemical Romance, make me have a little more faith in the music industry a bit more. With this decision comes that possibility of loosing fans and not being able to continue as far as they hope but the band continues to stay loyal to themselves thus continue to have loyal fans new and old. My overall rating for MUCC is a 8.9. While I do love them still, it's going to take me time to get use to their new stuff. Tatsurou(達郎）- Lead vocals and Harmonica.